Adults and Teens Can Straighten Their Smiles with Invisalign! Getting braces in Austin, Texas isn’t just limited to children. Adults and teens can also get the smile they’ve always wanted. At Westlake, we offer comprehensive options for straightening your teeth. When you come in for a consultation, we’ll address all of your concerns, take a look at your bite, and give you an individualized recommendation. Straightening your teeth may require traditional braces, but in most cases, Dr. Kyle Raymond can improve you or your teen’s smile with the trusted translucent Invisalign system. Invisalign is an alternative to traditional metal braces. It’s an attractive option for teens and adults. Why? Well, because it’s nearly invisible! Mature patients are often put-off by the idea of wearing metal brackets and wires. Sometimes people who would immensely benefit from braces don’t get them because of the way they look. And we get it – braces aren’t “cool”. Teens often don’t want to be seen with a mouth full of metal that catches food or makes them talk funny. And adults don’t want to look like a teen when they’re headed to the office or out on a business lunch. We don’t want teens to be teased due to their image, or cause self-esteem issues to develop. We also don’t want adults to look unprofessional or have their career affected by missing out on opportunities because of their treatment. Luckily, Invisalign has developed an aesthetic orthodontic system that can provide straighter teeth for both teens and adults. Invisalign uses clear plastic aligners that are custom fabricated using advanced technology to precisely move your teeth. Each set of aligners is shaped slightly different, allowing the progression of movement. They’re worn for about two weeks before transitioning to the next set. The rigid inside helps contribute to the movement of your teeth. But the outside of the aligners is smooth to the tongue and lips. Tooth-colored, removable “buttons” are sometimes placed on the front of teeth to play a role in how the system works. How Long Is an Invisalign Treatment? Orthodontic technology has come a long way. On an average, traditional braces may have to be worn for up to two years. Invisalign’s Align Technology can cut your treatment in half! Most cases with our dentist in Austin will take around 12 months to complete, but the type and amount of movement needed will determine how long you’ll need to be in treatment. If you or your teen want to see if you’re a candidate for invisible aligners, our dentist in Austin will need to see you for a consultation. During your visit, we’ll take a set of dental impressions or a series of intraoral images with a scanner. Both methods create a replica of your smile. Some x-rays and photos are usually taken as well. Our Austin, Texas, dentist Dr. Kyle Raymond, will work with the Invisalign specialists to help design a treatment plan just for you. This process may take a few days, so you may need to return for another consultation before we can show you a simulation of what your new smile could look like, and approximately how long your treatment would be. If you decide to move forward, we’ll go over your dental insurance benefits and help you make appropriate financial arrangements. 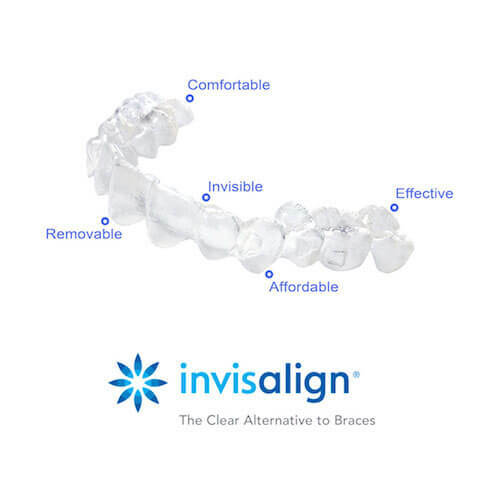 Our dentist in Austin will work directly with Invisalign to begin fabricating your aligners and once they’ve arrived at our office, they’ll be ready for you to stop by and pick them up! When it’s time to pick up your Invisalign trays, we’ll need to gently prep your teeth. Some “buttons” may need to be bonded onto specific teeth. Don’t worry, this is a completely pain-free procedure. You don’t even need to be numbed for it! Our Austin, Texas dentist will condition your teeth then bond a composite, tooth colored “button” which will stay in place during the duration of your treatment. On occasion, we may also have to do what’s called “interproximal reduction.” This process is also easy – it simply means that we slightly open up the space between specific crowded teeth, so they can move more easily. Once your teeth are ready, we’ll try in your first set of trays. Before leaving the office, we’ll make sure you can insert and remove the aligners yourself and know how to care for them. Typically, you’ll wear the aligners as often as possible, removing them only to eat, drink, or to brush and floss. Optimal results are seen when patients wear their trays for 22 hours a day. The unique Invisalign Teen system uses aligners that are fabricated with a blue compliance indicator. It makes it easy to ensure that teens are wearing their aligners enough. Teenagers sometimes need to be reminded that the only way Invisalign works, is if they’re worn for an adequate amount of time. Usually, we’ll send you home with a few sets of aligners for you to change out as directed. 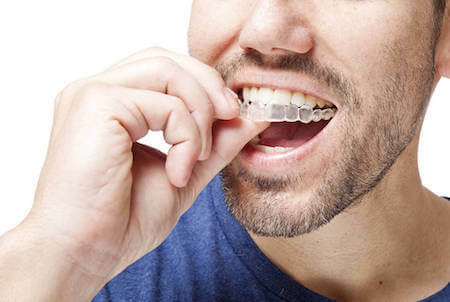 Periodically throughout your treatment, you’ll see our dentist in Austin for us to monitor your progress and send you home with more aligners. When you’ve successfully gone through all your aligners and your teeth are properly aligned, we’ll remove the buttons. You’ll also be fitted for a retainer, which will help maintain your new smile in its prime position. Orthodontics is an investment – both financially and time-wise, so it’s important to ensure that your straight teeth last a lifetime. Wearing a Vivera Retainer (made by Invisalign) will ensure your teeth don’t shift back to their previous location. It’s easy to get the smile that you’ve always wanted! Both teens and adults can straighten their teeth without having to put their lives on hold. If you or your child are interested in Invisalign in Austin, then call Dr. Kyle Raymond, DDS and the friendly staff at Westlake (512-732-0022) to schedule a consultation. We look forward to meeting you!